Our bathroom copper sinks are available as drop in bathroom copper sinks, undermount bathroom copper sinks and vessel bathroom copper sinks. 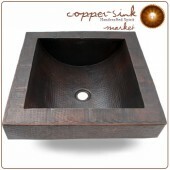 Our bathroom copper sinks are manufactured with top grade craftsmanship, using high quality materials. Our copper sink designs are nice, functional and affordable and are developed considering the needs of both, a small and functional bathroom, and as well as a nice, modern and contemporary bathroom design. For a sturdy and attractive bathroom sink solution, consider installing a bathroom sink. Our bathroom sinks are made of sturdy and reliable materials, and are available in a number of attractive styles. 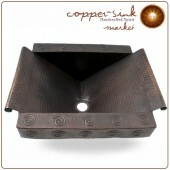 Copper sinks are a good value for your bathroom, as they will hold up for many years, even under heavy daily use. Another great benefit of a bathroom copper sink is that it is naturally resistant to microbes and bacteria that can cause illness. Because so many of your personal items come in close contact with your sink – toothbrushes, scissors, razors, tweezers, etc. – providing a germ free environment is important. Recent Environmental Protection Agency studies have found that copper alloy surfaces will kill more than 99 percent of harmful bacteria within two hours of contact, including germs that cause staph infections and the superbug MRSA. Doing something as simple as choosing bathroom copper sinks for your home can go a long way toward making your family safer from illness and disease. 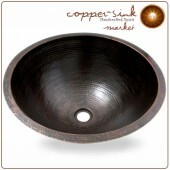 A classic, traditional bathroom sink choice, drop in copper sinks provide a pragmatic approach to your bathroom. With many varieties available, our selection of sinks should easily be able to match your style preferences and your budget. For an elegant, aesthetically pleasing look for your home’s bathroom vanities, consider using undermount bathroom copper sinks. Undermount sinks allow you to maintain a unity of style in your bathroom counter top, a look many homeowners find irresistible. Proper installation of an undermount sink is a must, as improper installation can result in leaks, but a professional craftsman or skilled DIY handyman can easily set up leak-free undermount bathroom copper sinks. Bathroom sinks can often be a hot spot for germs and bacteria, but thanks to the microbe and bacteria resistant properties of copper, you won’t have to worry about it if you install a copper bathroom sink. In today’s modern world of rapidly evolving illnesses, the peace of mind provided by a copper sink is an excellent value. 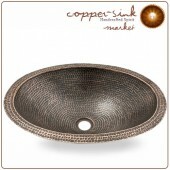 Vessel bathroom copper sinks are stylish, modern options for your bathroom. Vessel sinks sit on top of bathroom vanities instead of being built in to the counters, and can be used to achieve a unique, up-to-date look for your bathroom. We have several models of vessel sinks to choose from, with one certain to match the décor and practical needs of your bathroom. 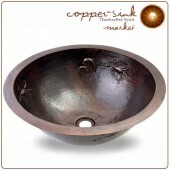 When it comes to craftsmanship, our copper sinks are unmatched. We take great pride in using the highest quality materials in our sinks, providing our customers a product that will remain functional and attractive for generations. For the very best in bathroom copper sinks, browse our selection of excellent products and also do a little research of your own into the benefits of using a copper sink. 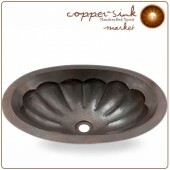 Once you realize how much value a copper sink can provide for your home, the decision will make itself.